Tweet Nest allows you to back up your tweets in a MySQL database, and you can use this nifty Web-based application to display and explore you tweets. Tweet Nest runs on the Apache/MySQL/PHP stack, and it's pretty easy to install. Grab the latest version of the application, unpack the downloaded archive, and move the resulting directory to the document root of your server. Make then the inc/config.php writable by the server, and point your browser to your Twitter Nest installation (e.g., http://127.0.0.1/tweetnest). A simple wizard guides you through the setup process. Next, you have to point your browser to the http://127.0.0.1/tweetnest/maintenance/loaduser.php URL to load the user account you created during the setup. Finally, point your browser to http://127.0.0.1/tweetnest/maintenance/loadtweets.php to load tweets, and wait till the application pulls the data from your Twitter account. To load new tweets on a regular basis, you can create a cron job on your server. Thanks to its simplicity, Tweet Nest is rather straightforward in use. The main page displays a list of all your tweets and the right column offers you a monthly view with a total tweet count for each month. Click on a month, and you should see all tweets posted on the selected month complete with a slick timeline at the top. The latter shows the number of tweets and replies by date. 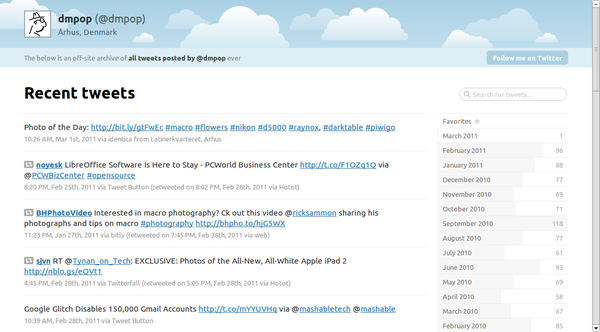 There is also a search field which lets you search through your tweet archive. Tweet Nest is not the most advanced solution out there, but if you are looking for a convenient way to archive your tweets as a searchable archive, it may be just the tool you need.